The Monticello Foundation, Inc. is a tax exempt corporation which was founded in 1994 for the sole purpose of financially assisting Monticello graduates as they extend their education or career training beyond high school. Scholarships are awarded each year with funds earned from the principal in the fund. With your support, we are able to continue to award thousands of dollars annually to deserving students. Your tax deductible donation is a gift that continues to give year after year. In addition to monetary donations, the Monticello Foundation accepts transfers or donations of stocks and property. Please contact your financial advisor to learn how to bring charitable giving into your estate planning. 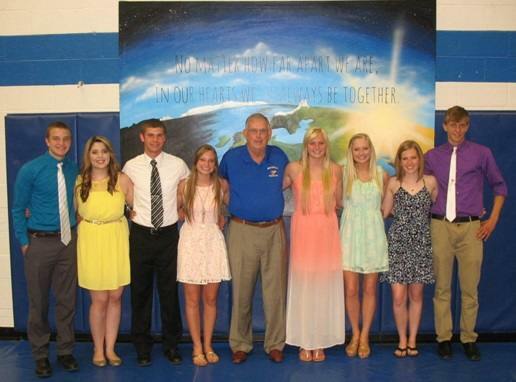 Shown here are 2014 Monticello High School Graduates who were each awarded $2,000 scholarships. (pictured left to right) Forrest Havens, Nicole Baebler, Lucas Marty, Claire Bruns, President of the Monticello Foundation-Elmer Lemon, Marissa Berg, Lauren Schilder, Clare Gietzel and Hunter Pratt.